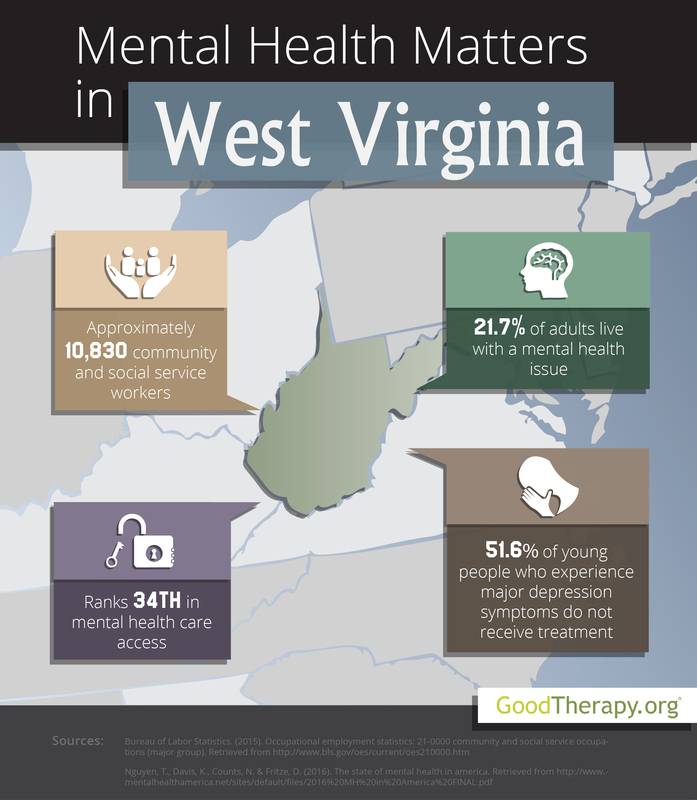 Find a therapist in West Virginia with GoodTherapy.org. More than 1.8 million individuals lived in West Virginia in 2015. Approximately 50.6% of the population is female. The ethnic makeup of the population consists of 93.6% white residents, 3.6% black residents, and 0.8% Asian residents. Elderly individuals account for 18.2% of all residents, while adolescents under 18 account for 20.6%. The median household income from 2010-2014 was $41,576. 10,830 West Virginia residents worked in community health and social service fields in 2015. Jobs within this occupational group, according to the U.S. Bureau of Labor Statistics, include working as a marriage and family therapist, probation officer, counselor at a behavioral health treatment center, or child psychologist. In the latest edition of the State of Mental Health in America survey released in 2016, West Virginia was ranked 39th in overall mental health—when compared to all 50 states and the District of Columbia. There is a high prevalence of mental health issues among residents in West Virginia. Therapists from Mental Health America (MHA) gave the state a ranking of 49th in this category, with approximately 21.7% of all adults affected. MHA researchers believe this low ranking is influenced by several socioeconomic factors such as high rates of obesity, child maltreatment, unemployment, and poverty in the state. Suicidal ideation among adult residents is a distinct concern among psychologists and psychiatrists in West Virginia as the state is ranked 50th in this mental health measure. Residents outnumber mental health providers by a ratio of 963:1. The state was ranked a low 49th in mental health workforce availability. Other factors such as a lack of finances or health insurance may negatively affect a person’s efforts to seek treatment. Nevertheless, therapy has proven to be extremely beneficial for many people. Residents are urged to take advantage of any resources provided by the public mental health system.